It was reported by Wendelle Stevens that on one evening during their visit to Switzerland in 1978, Meier showed the 11 color photos from his time travel trip to about 9-10 people who were sitting around the kitchen table, including Wendelle Stevens himself and his co-investigators Lee and Brit Elders, Meier’s ex-wife Kalliope and others from the group around Meier. However, according to Contact Report 106 from April 10, 1978, these 11 color photos along with their original negatives were taken away from Meier by the Plejaren ETs and were never returned again. These 11 color photos have never been published in any FIGU publications, nor were they published in Wendelle Steven’s or other investigator’s books/videos. Even if copies of these pictures would still exist, it would be very difficult to find the people who posses them and would also be willing to share these photos for our research. So for our investigation into these time travel pictures, we are limited to examining the information that has been published so far in the FIGU literature (contact reports etc.) and by several Meier-case investigators. This was also conveyed by Meier to the ET Quetzal in Contact Report 106 (April 10, 1978), 22 days after Meier traveled into the future (CR 104, March 18, 1978). Meier then explained to Quetzal about the assertion made by people around Meier and also by skeptics that all of the 11 photographs which he allegedly took during his time travel trip corresponded “very accurately” to parts of the painting. An explanation for these resemblances is given by Quetzal, but we will get into that later. Author Gary Kinder researched the Meier case between 1983 and 1987 and wrote about his findings in his book ‘Light Years: An Investigation into the Extraterrestrial experiences of Eduard Meier‘. On pages 217-218 he wrote about the now ex-FIGU member Herbert Runkel, who became “disenchanted” because of Meier’s San Francisco earthquake photos when a friend (Kurt Stadlin) of his found the illustrations in the GEO Magazine and “Meier’s pictures obviously had been taken of this lifelike painting.” According to Gary Kinder these photographs confused Herbert since he had experienced and seen so many remarkable things with the Meier case he could not explain. According to Meier, all of his photos and negatives were taken away by Quetzal after coming to know about the GEO magazine painting, in order to protect him from “further attacks” by skeptics (see ‘Billy Meier’ below). The same explanation was also given by FIGU Core Group member Guido Moosbrugger in his book Und sie fliegen doch! (1991). Since Kinder researched the case between 1983 and 1987 this would suggest that there were still copies of Meier’s original photographs available at that time in order to compare and determine their authenticity. On March 11, 2015, we have written to Gary Kinder asking him how and from whom was he able to obtain Meier’s photographs. So far we haven’t got any response from him. After commenting on these photos, Gary Kinder in 1987 further stated that Meier might have felt compelled to fake some evidence in order to meet the visitor’s and the inquisitive peoples demand for more information. According to Kinder, this naturally casts doubt on Meier’s other claims but doesn’t prove them to be false. In CR 106, Meier reports to Quetzal about the assertion that apparently all of the 11 photographs which he allegedly took during his time travel trip correspond “very accurately” (German: sehr genau) to parts of a painting rendered by an artist for an article in the European GEO magazine. According to Quetzal the similarity between Meier’s photos and the artist’s painting can be explained. An ET group known as the Baavi Intelligences, who closely work together with the Plejaren, are tasked with the mission to telepathically transmit images to sensitive Earth human beings like artists, scientists, science-fiction authors, etc. (who are completely unaware of these transmissions) to prepare the Earth people for future events, inventions, developments etc. Regarding the impending San Francisco mega-earthquake, they were supposed to “transmit” the image (which “coincidentally” would be very similar to Meier’s photographs) of the devastation only in the autumn of 1978, but they mistakenly transmitted the image at least a year too early, so the painting made according to these transmissions got published in the September 1977 issue of GEO magazine, months before Meier made his photographs on March 18, 1978. After Quetzal came to know about the painting in GEO magazine he took away all of Meier’s photographs and negatives to protect Meier from “further attacks” by skeptics and critics (both within and outside his group) who were already calling Meier a liar and a hoaxer. But apparently some of Meier’s pictures were still available at least between 1983-1987 for the investigator Gary Kinder to compare them with the image(s?) from the GEO magazine. Let’s evaluate what supposedly happened here: Meier requests an unexpected time travel into the future to the impending San Francisco mega-earthquake (CR 106). When arrived, he specifically asks to see the Transamerica building and takes a few pictures. Only later, it turns out, that Meier’s pictures (closely) match the image(s?) published in the GEO Magazine several months prior to Meier’s trip into the future. The reason given was that the artist was inspired with telepathic-image transmissions from the Baavi Intelligences (allies of the Plejaren) who mistakenly transmitted this image at least a year too early (CR 106). The contact reports clearly suggests that both Meier and Quetzal were not aware of this before and during the trip into the future. The initiative for the time travel came from Meier, who could have requested a trip to any other location and time, or could not have requested a trip at all. He could have made pictures from any location (altitude, direction and angle) under any lighting conditions (time of the day). Yet his pictures closely match the illustrations transmitted to an artist by the Baavi Intelligences, who “coincidentally” also made the mistake of transmitting them before Meier made his trip, instead of after. And how could Meier’s pictures possibly match image(s?) transmitted by the Baavi Intelligences? Did they travel to the future to see what Meier’s pictures would look like and then transmitted these images to the artist? Considering the many factors involved that could have been different this situation can hardly be explained by coincidence, yet, there seems to be no apparent reason or deliberation by anyone involved to ‘match up’ all these factors so perfectly in order to create this peculiar situation. (…) Kurt had gone to a restaurant in Zurich, where someone was just reading through this magazine, and then he saw the picture, because it was shown in this. Now of course he went and explained to someone behind my back, that I likely would have photographed parts of this picture. FIGU Core Group member Bernadette Brand wrote her testimony on these pictures which was first published in Stimme der Wassermannzeit Nr. 63 (June 1987) and Nr. 64 (September, 1987) under the title ‘Hinterschmidrüti’. It was again published in 2001 in Zeugenbuch (witnesses book). From Brand’s testimony it becomes apparent the “someone” Kurt talked to behind Meier’s back was her. In CR 104 Meier also mentions that he took photographs of the San Andreas fault, specifically at a location 300 kms away from San Francisco. Curiously, there are two photographs of the San Andreas fault on pages 38/39 and 52/53 that are “coincidentally” from the same nearby region. Brand also mentions that Meier also had shot a picture or pictures showing collapsed bridges and damaged roads. “Coincidentally” there is also a picture showing collapsed bridges and damaged roads in the same magazine article on page 40. Gary Kinder’s conclusion that all of Meier’s photographs “came right out of the September 1977 issue of GEO Magazine” might suggest that these Meier’s photographs of the San Andreas fault and the damaged bridges and roads resemble the real aerial photographs made by different photographers. In a response to a question in the FIGU forum Q/A section on September 30, 2014, Meier also stated that Bernadette Brand came to the conclusion that Meier did not take the photographs from the magazine picture, after she compared Billy’s photos with the picture in GEO magazine. Additionally Meier case investigator Wendelle Stevens (see below) implied on multiple occasions there were differences between Meier pictures and the GEO magazine illustrations, whereas Gary Kinder and apparently also Herbert Runkel concluded that they were identical and came from the magazine. Apparently to prevent further attacks on Meier, they were allegedly taken away from Meier and destroyed by the Plejaren. So we cannot verify whether Meier’s pictures were exactly identical to the illustrations or not. But if there really were significant differences that would exclude the hoax hypothesis, wouldn’t it have been logical for Meier/FIGU (and the Plejaren) to publish his 11 color photos so that people could have verified for themselves and confirm whether Meier’s claims are credible or not? Is it so hard to imagine the removal and destruction of the pictures could be interpreted as confession of guilt and would lead to further criticism? Just as it is the case with the human beings of Earth, Plejaren can also get angry and do things which are not „entirely“ logical. These excerpts suggest that all of the disaster images that resemble Meier’s photographs have been transmitted to a single highly sensitive artist who then rendered these as illustrations or paintings for the September 1977 issue of the GEO magazines. This cannot be right since the 16 photos/illustrations in the GEO magazine article were made by different artists (see list under ‘Ex-FIGU member Kurt Stadlin‘). Even the painting spread over pages 36-37, showing the destruction of San Francisco, was a collaborative effort as it is a photograph by Max Scheler that has been re-designed and painted over by Ludek Pesek. Whereas Bernadette Brand implied there were significant differences, Guido claims that several members of the core group established that there were only a “few minimal differences” between Meier’s 11 color photographs and the illustrations from the GEO magazine. The other points Guido discussed are similar to those of Bernadette Brand, which already have been addressed above. Wendelle Stevens described a specific car model – “that looked more like a Volkswagen” – which had some specific features not seen in the cars of that time. However these features aren’t visible on any cars in the GEO magazine painting, although there is a car that is similar to a Volkswagen Beetle from the 1970s. The other ‘boxy’ cars resemble contemporary models from the 1970s (see the painting with all the cars marked red here) Below is a close-up of the Volkswagen Beetle type car and the “boxy” cars (ex: Cadillac series). Wendelle never had the chance to make a side by side comparison between the painting and Meier’s pictures, because allegedly these were already taken away by Plejaren, so he made a comparison from memory. In his open letter to the UFO community Gary Kinder writes he did make a side to side comparison and concluded Meier’s pictures were identical to the painting. Would that indeed be the case it might be possible Wendelle didn’t remember the details of Meier’s pictures correctly and misinterpreted a ‘normal’ Volkswagen Beetle as a futuristic car, perhaps due to poor quality of Meier’s pictures which is the case with all of Meier’s other space- and time travel pictures. Since we don’t have Meier’s pictures available with us, we are unable to verify who is right. Another interesting note here is that other than Wendelle – who was among nearly a dozen other people who saw these pictures – nobody has reported seeing futuristic cars or for that matter any futuristic elements in the Meier’s 11 color pictures at all. We have written to Lee Elders on March 28, 2015 on whether he agree with Wendelle Stevens version of the incident. We yet have to receive a response from him. According to Stevens the reason why the negatives and color prints of Meier’s San Francisco earthquake photographs were taken away by Quetzal is that Meier showed them to Wendelle and his team without their approval. However this is a completely different reason from the one that was given by Meier. As already mentioned, according to CR 106 Quetzal took the pictures away in order to save Meier from “further attacks” from skeptics and critics because of the similarities between Meier’s pictures and the GEO magazine illustrations. In CR 104 Meier even asks Quetzal if he is allowed to publish his San Francisco earthquake pictures, to which Quetzal has no objections, as this would save many human lives (verses 89-90). Both contact reports were published in Wendelle’s own publication, Message from the Pleiades Vol. 4, so it is strange that in the same book Wendelle gives an entirely different and contradictory explanation than the one given in the Contact Report 106. “I later obtained copies of the GEO magazine and then remembered that the article there only one painting of the destruction bled over two pages whereas I had seen eleven pictures in Meier’s house. Now, where did he get the other ten if, as his accusers say, “He copied the pictures from the GEO magazine article”. Wendelle suggests that since there is only one painting in the magazine showing the destruction of the city, only one of Meier’s pictures could have matched the painting. This might suggest that all of Meier’s pictures were similar to parts of the GEO magazine painting, which is consistent with the information in the Meier’s CRs. Wendelle claims that these 11 color pictures looked like real photographs and not like photographs of paintings. This doesn’t necessarily exclude the possibility they came from the GEO magazine article (also taking in consideration Gary Kinder’s conclusion they were identical) since the article contained a number of real pictures and the painting is actually quite realistic. There are some real aerial photographs of the San Andreas fault taken at the same nearby region which “coincidentally” Meier also happened to have visited and photographed according to CR 104 . Another real aerial photograph of Interstate 210/Interstate 5 overpass collapsed onto San Fernando Road in Sylmar, the northern San Fernando Valley, Los Angeles during the 1971 San Fernando earthquake, was also published on page 40 in the article. 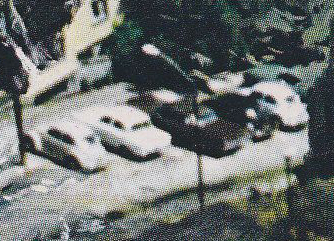 Did Wendelle perhaps saw these real aerial shots in Meier’s pictures that gave him the impression of real photographs? It’s not entirely clear whether Wendelle means the disaster could still be avoided or could have been avoided. Either way, he seems to suggest that according to the Plejaren the cause of the earthquake is our negative thoughts and energy, instead of a release of energy in the Earth’s crust due to plate tectonics. This is nowhere suggested in the FIGU books, contact reports etc. When Meier asks in CR 104 if he is allowed to publish his pictures Quetzal replies with: “Surely there would be nothing to object against this, for thereby very many people would then leave San Francisco and settle elsewhere before the catastrophe arises. This would save very many human lives.” This suggests there is no way to avoid the Earthquake itself and it is just a natural occurrence, people could only save their lives by leaving San Francisco. Billy, if you were to time travel to the future again, to the San Francisco earthquake for the second time with Quetzal then would you see buildings collapsing in the exact same manner, the same number of casualties and so forth? In other words, would you see the exact same scenario as you did the first time or would it be different? Since it was a real travel into the future, everything would happen exactly the same way. Logically! Billy, regarding your trip into the future to the San Francisco earthquake; is this future event as you saw it, a done deal, a 100% certainty or can this event be avoided or the extent of damage, lessened by the course of our actions? Of course this future event cannot be avoided or lessened in any way. It will happen exactly as Billy saw it during his trip into the future. In other words: It is 100% certain that San Francisco will experience a severe catastrophe! 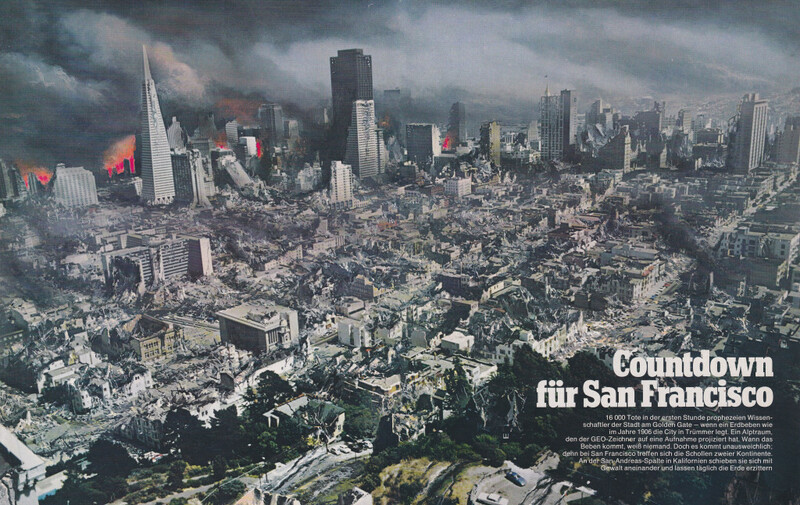 We have analyzed the claims surrounding 11 pictures of a future San Francisco earthquake Meier allegedly made during a time travel into the future, which reportedly turned out to be at least very similar or even identical to illustration(s) in a GEO magazine issue from September 1977, published six months before Meier’s trip into the future allegedly took place. There are both claims that Meier’s pictures were identical to the GEO magazine illustration and that there were a “few minimal differences” or even significant differences. Since the pictures were allegedly taken away by the Plejaren, we cannot draw draw any conclusions about their authenticity, and whether or not there were any significant differences between Meier’s pictures and the illustration(s) of the GEO magazine article that would rule out the hoax hypothesis. Yet we are given an extraordinary explanation regarding the similarity between Meier’s pictures and the GEO magazine illustration(s). According to the contact reports this is caused by telepathic transmissions of images send to the artist by the Baavi Intelligences, extraterrestrial allies of the Plejaren, who mistakenly allowed the image(s) to be published in the article before Meier made his pictures during a time travel into the future, instead of later. Given the notion that Meier (who presumably knew nothing of these transmissions) requested to, out of all possible times and places, requested to be taken to the scene of the future San Francisco earthquake and made pictures that at least to a certain extend matched the perspective (altitude, direction and angle), lighting conditions etc. of illustrations based on images transmitted a couple of months earlier, this seems to be an extremely far fetched and unlikely explanation.